Home » Law Life » It’s Baaaaaack! So, long long ago when I had time for reading such things, I used to share tons of fun stories from Huffington Post! But with finals and now being home for Christmas, I haven’t pulled up Huffington Post on my computer in weeks! I thought it was time to bring it back. So many good stories! I am a huge fan of independent coffee shops. They always have a great vibe, they are usually unique with some fun drinks and are great places to read, study and do some people watching! Huffington Post listed the 10 Coolest Independent Coffee Shops Across the US. They are in all different areas of the country, even a few in the midwest! There was one listed in Chicago called Star Lounge, which I’d actually never heard of! It’s not anywhere near my school or apartment, but the menu looks amazing so I’m definitely going to try and check it out sometime this semester! Are there any listed where you live? Have you been to any? So, you might all know that I LOVE cake and this includes cupcakes (obviously gluten free now… like the cake my brother got me for my birthday!) so you can imagine how upset I was when I saw a story about how a woman’s cupcake was confiscated in security at the airport! I know you’re not allowed to bring liquids through, but I’ve always brought food and never had a problem with it! The security guard claimed that he icing was too much like a liquid, and was clearly more than 3oz! Apparently, if you want to get a baked good through security, you better beware that it might not make it!!! Have you ever taken baked goods through security? Any problems with food items? Another great food-related story involves a LOT of ice cream! 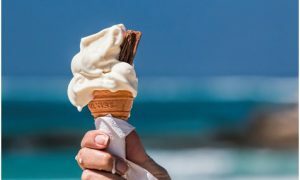 In Fort Wayne, Indiana, 40,000 pounds of ice cream spilled from a tipped semi-trailer and ended up closing two lanes of interstate 69 and took almost 6 hours to clean up! They should have called me, the clean up would have gone much more quickly! What I want to know, is what happened to that ice cream? Did it continue on to the store, or was it damaged? These are the important things in life… Oh and the driver had minor injuries. Just FYI. And one last food-related story that I had to share! Huffington Post listed the Top 10 New Foods of 2011. Now I have to be honest, I have neither tasted, nor HEARD of any of these ! Check out the list and let me know what you think of them! The one that most intrigues me is the Kouign Amann, which is like a croissant with twice as much butter and sugar and is from Brittany, France. Although technically I couldn’t eat it, I LOVE croissants and the way you can pull apart the bread. They look and sound absolutely delicious. The one that totally freaks me out would definitely have to be the Buffalo Chicken Shake, which was made after it was “made up” on the show 30 Rock and then created by Lunch Blog KC. 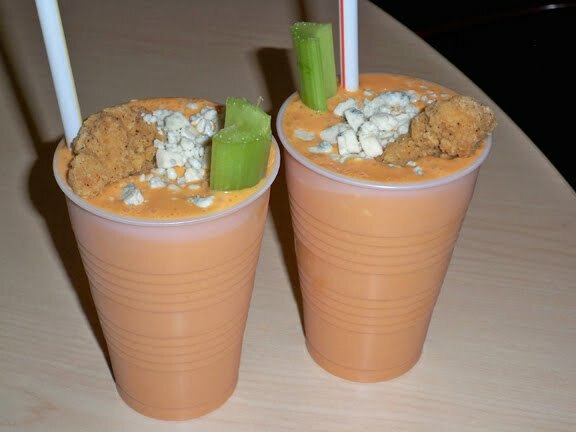 The shake is made with heavy cream, milk, blue cheese, tomato juice, buffalo wing sauce and Worcestershire sauce. Have you ever heard of any of the foods? Which one would you most like to try?